Beauty Aura brings you 100% pure peppermint oil, steam distilled from fresh peppermint leaves. All Beauty Aura essential oils are packaged in USA to ensure purity. Our peppermint oil essential is the ideal choice for any use due to its potency, purity and premium quality. You can use it as a: - AROMATHERAPY OIL. Experience the refreshing scent of peppermint oil, which is believed to boost concentration, lift the spirits and enhance mental acuity. 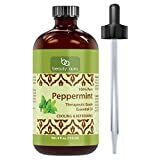 Compared to other aromatherapy essential oils, peppermint oil from Beauty Aura offers a more prominent minty menthol fragrance due to its purity. Use it in a diffuser, in bathwater or mixed with a carrier oil to experience the remarkable fragrance of peppermint oil. - NATURAL PEST REPELLANT. Peppermint oil mice and pest repellant has been successfully used for centuries as a cruelty free, nontoxic way to rid homes of unwanted creatures. Beauty Aura is free of synthetic additives, making it a truly natural choice to repell spiders, mice etc - NATURAL BEAUTY SOLUTION. With no additives that can irritate your skin or scalp Beauty Aura offers the best solution for peppermint oil hair and skin treatments. Peppermint oil for hair is often used to calm inflammation and itchy scalp, and on the skin, peppermint oil may soothe all types of irritation, including minor skin infections and rashes. - Take a green approach to beauty, or maintaining a clean, pest-free home. Order Beauty Aura 100% Pure Peppermint Essential Oil today.